The new settings for this issue are listed below. Welcome to a world of super-heroic adventure. Here you will find both four colored fisticuffs and secret-laden shadows, empowered modern demigods and mere mortals willing to face them. 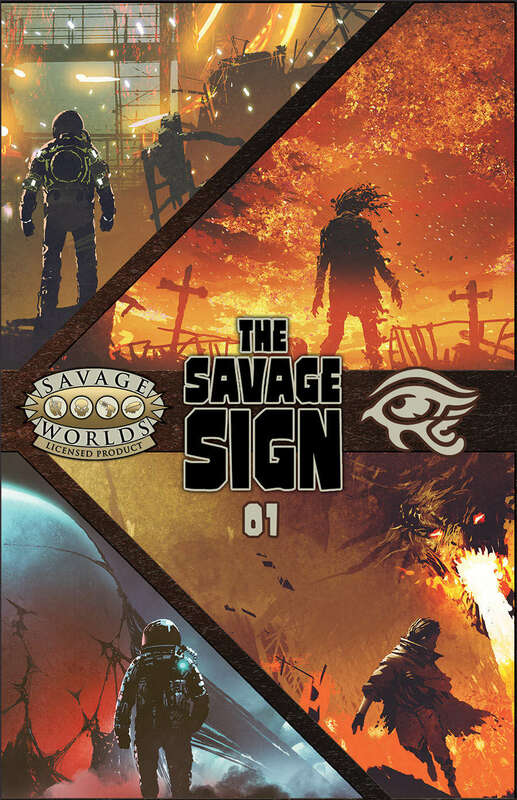 Our comic, SIGNAL STRENGTH, takes place in the Pantheon setting, and the story will unfold in 6-page chapters through the multiple issues of The Savage Sign. Our fiction also takes place in the Pantheon setting and reveals the origin story of a brand new super. The future. Humankind has expanded into the universe. We have discovered not only wonders without, from the remains of ancient civilizations to a dizzying array of habitable worlds but also wonders within: the inherent power of consciousness called psionics. Despite its expansions and advances, however, humankind remains ever at war, and in the far future, those wars spread across the cosmos powered by billion-year-old weapons of mysterious origin. Set in France in 1789, on the eve of the French Revolution, Revolution features swashbuckling musketeers dueling in the streets, alchemists concocting strange compounds in their alchemical labs, and intellectuals, spies, and members of secretive, occult societies plotting and plying their revolutionary ideas in the salons of French aristocratic Paris, all while the heady draught of revolution brews across Europe. This is a post-apocalyptic setting of dark survival in a world ruled by three plagues: vampires, werewolves, and zombies. The players take the roles of survivors trying to find a way to close the Door: a gateway that links their world to our own. This supplement is a solid addition to your bag of Savage tricks. Complete with new settings, setting rules, and fresh ideas, this will give your Savage sessions a real shot of adrenaline. Cop this product!!! Thank you, glad you're enjoying it!